Equipment and price | What Car? 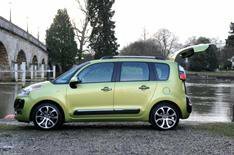 The C3 Picasso is one of the more expensive mini MPVs, but you should be able to secure a good discount, and strong residuals are predicted. Three trims will be offered, with entry-level VT cars likely to get stability control, front and side airbags, and front electric windows. Exact specs are still to be confirmed, but you'll probably have to pay the 1100 premium for VTR+ spec if you want curtain 'bags, rear electric windows and air-conditioning. Range-topping Exclusive trim will set you back a further 1100, and should come loaded with luxuries such as dual-zone climate control, electric-folding door mirrors and parking sensors.